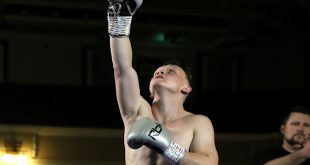 On Saturday night, Liam Conroy of Barrow-in-Furness retained the English Light-Heavyweight Title with a second round TKO over Miles Shinkwin of Bushey, Hertfordshire. A right to the head in the second round followed by a number of clubbing rights to the head left Shinkwin looking dazed. Conroy backed him into the neutral corner and subjected him to a further onslaught with Shinkwin unable to respond. Referee Shaun Messer jumped in to stop the contest. 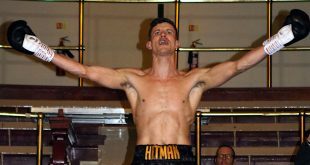 Chorley’s Jack Catterall made quick work of experienced Stourbridge boxer Kevin McCauley in their scheduled six round Super-Welterweight contest. McCauley took a body-shot in the opening round and was counted out while still on his knee. 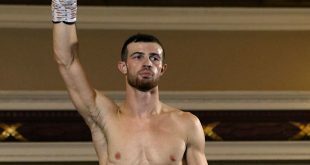 Belfast’s Alfredo Meli had Romanian opponent Romeo Paun (Bucharest) on the canvas twice in round one of their scheduled 8 round Super-Middleweight contest, with body-shots. Referee Darren Sarginson waved the fight off deeming Paun in no position to continue. Sale’s Ben Sheedy was up against busy Darryl Sharp of Middleton in a 6 round Middleweight contest and secured a points’ win 59-55. 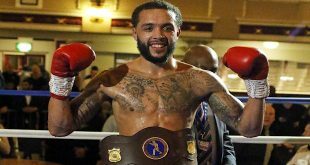 Preston’s ‘Magic’ Matty Clarkson made a comeback after three and a half years to face late opponent Dmitrijs Kalinovski of Klaipeda, Lithuania. Clarkson gets back to winning ways with a points’ victory 40-36 in the Cruiserweight division. Debutant Sahir Iqbal of Bolton had a good first pro outing against MJ Hall of Brierley Hill. Iqbal dominated throughout to notch up his first pro-win on points 40-36 at Super-Welterweight. Glossop’s Adam Hague scored a 60-54 points victory over Fonz Alexander of Newark at Super-Lightweight. Cruiserweight Lawrence Osueke (Newcastle, Tyne and Wear) secured a shut-out points victory 40-36 in his first pro-bow against Jindrich Velecky (Ceska Trebova, Czech Republic). Velecky sustained a nasty cut to the left brow in the fourth but sees it out to the final bell. Damian Chambers of Dukinfield also had a first round win. Imantas Davidaitas of Klaipeda, Lithuania, was down twice and not allowed to continue by Referee Sarginson despite Davidaitas protesting that he was ok to proceed. Chambers wins by TKO round 1 in the Cruiserweight division. The third debutant of the night, Light-Heavyweight Michael McGoldrick, did well to keep focused against a lack-lustre Remigijus Ziausys. The Lithuanian opponent threw few punches whilst McGoldrick kept busy – scoring with body-shots in the second round. Ziausys sustains a cut to the left eye area in round three but continues and McGoldrick, unsurprisingly, goes on to score a 40-36 points’ win. Wigan’s Sotiris Papageorgiou of Greece survived a cut to the right brow in round three of a 4 round Super-Welterweight contest to win a points victory (40-36) over Italian-born Victor Edagha of Southwark.